This October half-term, the Alfred Gillett Trust are hosting a free pop-up exhibition of fossilised ichthyosaurs found in Street. From 29 October to 3 November, the public can view the fossils and learn about their discovery and what they tell us about the local environment. There will be a selection of roar-some kids activities taking place throughout the week. Known as ‘sea dragons’, ichthyosaurs were dolphin-like marine reptiles which swam in the warm seas which covered Somerset around 200 million years ago. Street is known internationally for the quality and quantity of the fossils found in the local Blue Lias rock. The fossils were found in local quarries in the 19th century by Alfred Gillett, a cousin of the founders of Clarks the shoemakers. First displayed in Glastonbury Town Hall in 1880, the fossils were soon moved into a purpose-built Geological Museum in Crispin Hall in Street, which was opened in 1887. The fossils were finally taken off public display in 1978 when they were moved into storage for conservation. Now the Trust is opening up the collection to give locals and visitors another chance to come face-to-face with the famed sea dragons. The exhibition is open to the public throughout half-term from 10am to 5pm (Monday 29 October to Saturday 3 November). Entrance is free, but donations towards the care and future display of the fossils would be gratefully received. Do something new and join the FREE exhibitions being held at the Grange in Street, specially curated by the Alfred Gillett Trust for Heritage Open Days, England’s largest annual festival of history and culture. Put your best foot forward and let your eyes delight at our ‘Footwear in Focus’ photography exhibition. Charting the evolution and changing designs of footwear, these images were captured as part of our project to digitise our 25,000 strong collection of footwear through the ages. As part of the national celebrations at the heart of Heritage Open Days our archive exhibition ‘Extraordinary Women’ tells the story of four inspirational individuals. From a local hero tasked with the education of the workers to a fashion designer collaborating with the global footwear company Clarks, who will be your favourite? The free exhibition is being held at the Grange in Street (opposite the Clarks Village food court). It is open from 10am to 5pm from 6th to 16th September 2018. On 26th July 1913 the National Union of Women’s Suffrage Societies (NUWSS) gathered at Hyde Park in London for a rally in support of Women’s Suffrage. Some sources suggest that up to 50,000 people, both men and women, attended this peaceful rally. In her diary of July 9th Helen Clark writes that she and her daughter Esther met the NUWSS pilgrims at North Petherton and travelled with them to Bridgwater where they stayed overnight. The pair accompanied the procession as they travelled to Street the following day; Helen records that they were greeted with “a very fine entry and a large meeting with two platforms”. Frances Sterling, the tall lady with the cane in the picture above, is recorded as staying with Helen and William Stephens Clark at Millfield when the pilgrims passed through Street. As chief spokesperson for the West of England contingent it is likely that Frances would have been one of the many speakers at the rally when it met in Hyde Park. The parent company of Norvic Shoe Company Limited was Howlett & White, which started out as a leather currier. Warnes Howlett invested ten thousand pounds in Robert Tillyard’s leather currying business in around 1846. The extra money allowed him to move to Princes Street, into a larger premises. In 1856 George White agreed to join the Howlett company as a junior clerk, eventually working his way to the top. In 1876, when George White was general manager, he became co-partner with John Godfrey Howlett. George White had a factory built to avoid workers manufacturing at home, which he thought was wasteful of time. One of the company’s achievements was the use of machines to cater for its sports users. One machine was used for inserting running spikes into shoes, whilst another was a corrugating machine for tennis shoes. Additionally, the Norvic solid rubber heel was believed to be the only solid heel in existence at that time. Throughout the 19th century, the firm concentrated on making women’s shoes. They also supplied shoes globally to the British Empire, including Australia, New Zealand and America. Because of competition at home, the firm bought smaller firms to make men’s and children’s shoes. The company merged with Kiltie (S. L. Wilton Ltd.) around 1926 to produce children’s shoes. And in 1922 Howlett & White formed an association with Oakeshott & Finnemore to produce men’s shoes. Just before 1913, Sir Ernest White and Cecil Colman persuaded the board to begin national advertising, using the name Norvic. This early experiment in national advertising was very successful. Consequently, Howlett and White became ‘Norvic’. During both World Wars, Norvic produced shoes for the Allies, which included boots for the Armies of England, France and Russia and fur-lined boots for the air force. During 1959 the firm recognised the teenage market made up only 9.7% of the population but spent 18.8% of the nation’s total expenditure on shoes. Consequently the firm employed a board of 7 teenage girls to provide advice on marketing to teenagers. Unfortunately, Norvic closed in 1981. On this day in 1913, members of the National Union of Women’s Suffrage Societies began their Pilgrimage towards Hyde Park, London. 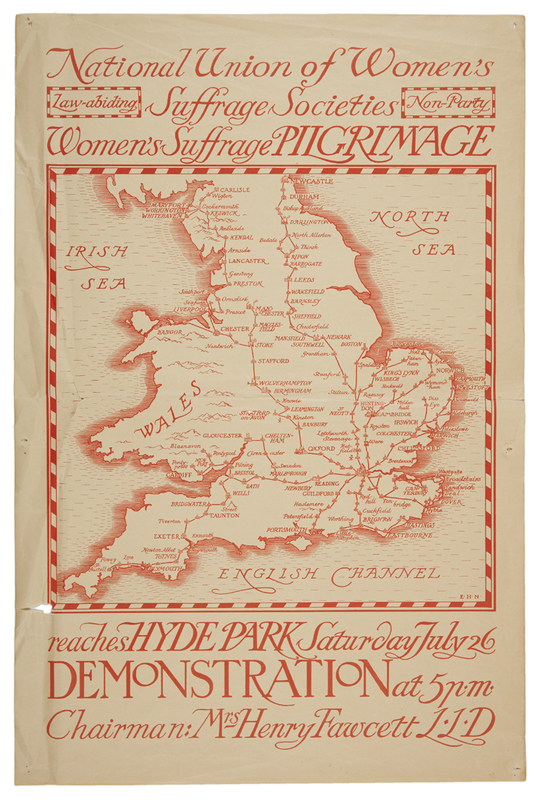 This poster, designed by E H New, illustrates the six routes travelled as part of this Pilgrimage that sought support for the campaign for women’s suffrage. Discover hidden gems like this by accessing our research and enquiries service. Carl Franz Bally (1821-1898) was the son of a silk-ribbon weaver. After being inspired by shoes on display in Paris, he founded ‘Bally & Co.’ in 1851, along with his brother. Carl employed German shoemakers to hand-make shoes in the basement of his own home. He aimed to create exquisite footwear from the finest leather, using the most innovative craftsmanship, infusing a strong sense of functionality and modernity. After initial problems with production and quality, and after the company grew, a factory was built in 1854 in the centre of the village. In 1860 Bally employed 500 craftsmen and transformed the village of Schönenwerd into a Company Town (remind you of anywhere?! ), offering a host of benefits from healthcare to social amenities. Bally’s achievements have been numerous, most famously, Charlie Chaplin being featured in one of its advertising films in the 1930s, created by advertising industry pioneer Julius Pinschewer. Additionally, the Bally Rominger Ski Boots were worn by gold-medal winners at the St. Moritz Winter Olympics in 1948. In 1976, Bally expanded beyond footwear, and started selling clothing and accessories such as handbags. In 1990 they expanded globally, opening and growing operations in countries such as Japan, Australia, Turkey and Brazil. Further details about the heritage of Bally can be found here. Peter Yapp Ltd. the shoemaker was established by Samuel Yapp in 1793 in Chelsea. His son George joined him later, when the business was located at 200 Sloane Street. In 1851 Peter, the son of George became involved with the business, and by 1870 the business had expanded to include 201 and 210 Sloane Street in London. A Royal Warrant was awarded to Peter Yapp by Queen Victoria, which it continued to hold until its demise. The Yapp company supplied shoes to the princesses Elizabeth and Margaret as they grew up, as the Yapp family concentrated on making shoes for the younger generation, especially those of distinguished society. George Yapp, who died in 1944, claims that his business was the first to respond to English feet being typically long and narrow, which required narrower fittings. Around 1944, C & J Clark Ltd. acquired Peter Yapp Ltd. via Peter Lord, but the company remained independent, as merging with Peter Lord would have meant forfeiting its Royal Warrant. Nevertheless, by this time, Yapp had ceased manufacturing footwear and concentrated solely upon retailing. An ongoing specialisation in the provision of footwear for children meant the children’s section was refurbished and re-opened in 1949 by Julia ‘Toots’ Lockwood the eight-year-old daughter of actress, Margaret Lockwood. On 19th February 1959, the shop was re-opened following the refurbishment of the women’s and children’s sections. At this point Yapp was selling, amongst other brands, Clarks Skyline shoes. Sadly, on 19th January 1971, the company ceased trading after 178 years. Reading Edwardian letters can be a tricky thing! Handwriting may look stylish on the page, beautiful even, but getting to grips with their actual reading can be an altogether different matter. So, in conjunction with our MCG cataloguing project one of our talented volunteers, Wendy, has been producing transcripts of associated documents to assist researchers in the future to understand the contents and context of this resource. What began as an associated project however is beginning to illuminate the value of many other family archive collections. Take for example the Millfield Visitors Book of 1897-1910. One can only imagine the dinner party conversations between the Clarks and the continuous flow of suffragist, liberal, socially aware and academic visitors, many of the Quakers, who stayed with them. How influential would this forum have been to the spread and development of ideas? On this anniversary of the Representation of the People Act 1918 it is interesting to reflect on the visitors to Millfield in just one year 1904, a year when frustration with the lack of progress in women gaining the vote led to the beginnings of militant action. Helen Priestman Bright Clark, who had been publicly campaigning for women’s suffrage since the 1870s, played hostess to her equally long-time suffragist aunts Margaret Tanner, Anna M Priestman and Mary Priestman in July 1904. September of the same year sees a visit by young relations Fay McLaren (later known as the activist Lady Norman) and Henry McLaren (elected Liberal MP in 1906) at the same time as Joseph Chamberlain’s niece Charlotte. Staying with the family from 4-7 October Emily Hobhouse – whose descriptions of work post Boer War in South Africa were to have such an influence on Margaret Clark. Altogether 74 visitors are known to have stayed at Millfield during 1904 – a mix of relations, Quaker Friends and fellow campaigners from around the globe from Somerset to Australia. I for one would have loved to have been a fly on the wall! Over the last week we documented, cleaned, photographed and repacked over 90 shoes for the Shoe Digitisation Project. These were men’s and women’s shoes dating from 1953-1969.